Firefly Villa is located at No. 1, Jalan SGG5/4, Sungai Gulang-Gulang, Tanjong Karang, 45500 Selangor. It is within the historical town of Kuala Selangor and about 1.5 hours drive from the capital city of Kuala Lumpur. It is surrounded by most things that bring people to TanjongKarang/Kuala Selangor – the scenic rice field, coconut, oil palm and banana plantations, firefly park, nature park (for jungle tracking and bird watching), Bukit Melawati, Sky Mirror and the local recreational and historical sites. It is also located near to the strategic spots for watching local and migratory birds. A lush green riot of tropical plants surrounded the villa including swimming pools and gazebos. Step back to a time where the only noises are a tickling of water, the rustle of palm leaves, birds chipping, and frog and cricket symphonies. Find a stillness and peace far, far away from the everyday city life. The entrance gate is made in typical Balinese style leads to the main building. It comprises of four bedrooms each with en-suite bathroom. The King Room is equipped with a mini refrigerator and Jacuzzi (cold water only). The villa is also featuring a spacious living, dining and TV area. It is fully air-conditioned and equipped with modern amenities including wifi for free Internet access. Villa owned by a nice and friendly couple. They are very accomodative and makes us feels like home. Breakfast was great and filling. Room is very clean and spacious. Firefly villa is a quiet and peaceful to get get away from hustle and bustle of the city. Also close to the javanese popular dish Nasi Ambeng. Highly recommended. Our last minute plan to stay at Firefly Villa was really worth it. We decided to stay there after attending wedding in Ijok. The rooms awesome. You can experience the tranquility and serenity as it is located away from the main road. Scale from 1-10. I will give a`9.9. The 0.1 you have to experience it yourself. Definitely a must go. Certainly the best place to be around Kuala Selangor. A bit difficult to find, but once you are there it is absolutely fabuleous. Very quite garden and a nice swimming pool and very clean and spacious rooms. The breakfast was too much to handle. Warm dishes, fruit, soup, salads; we almost felt guilty that we could not taste everything! We stayed here two nights and it is absolutely recommended if you need a relaxing break during a hectic stay / holiday in Malaysia. And it is only 10 minutes away from the centre of Kuala Selangor, 5 minutes from the fire flies and 5 minutes from a few superb fish restaurants on the river side. We spended 2 nights soon after Christmas 2011 at Firefly Villa. The surrounding is so peaceful and beautiful, even the couple that runs the place is so accommodating and friendly. Our 3 kids just loved the swimming pools and the animals that roams the compound. One have to taste Kak Zah’s cooking. She prepares the best delicious bountiful breakfast that no mind can image of, unless you were there. The rooms are so spacious and clean. We still reminisce of the time we spended our holiday at Firefly Villa. We rated Firefly Villa, as a 5star***** homestay. We stayed 2 days (January 8 and 9) at Firefly Villa and we just loved it! The atmosphere of the house and the surroundings is pleasant and peaceful. Hospitable, friendly and accommodating owners and delicious home cuisine impressed us very much. The villa is a real paradise both for gastronomic gourmets and nature-lovers! When we step into the Villa which was the old-style arch of the garden, we felt very calm and peaceful as the luscious green plants and the reflection of Balinese reflection that surrounded us that time gave us a very refreshing feeling. The first good impression of ours did not died there as we continuously felt very pleased by the colorful and beautiful design of the interior of the house. The cleanliness of the house is also very well taken care and well managed. Said a few members of our family, what pleases us the most was the first class service and very nice treatment that we got from both En, Apandi and Pn. Zah. And we also must not forget the mouth-watering breakfast that was well prepared for us. It was very fantastic and leave our family a really fond of memories. And so with the good and unexpected responds from our family members, we will surely would like to have FIREFLY VILLA once again as our choice of holiday destination next time, Insha Allah. We have had the best family vacation ever during our 2 nights stay in this wonderful villa. Frankly it surpassed my expectation, very clean and large rooms complete with amenities such as a pair of bath towels, hair dryer, bath robes, kettles just like a modest 4 star hotel with Astro Byond in each room, good conditions of air-conditioner and ceiling fan. Trust me you could not ask for more. The surrounding is great with few animals roaming around creating the real “kampung” ambiance in a luxury home. We love the swimming pool and since we had the villa all for ourselves, it is like holidaying in a luxurious vacation home. The owners Encik Apandi & Auntie Zah are very nice and friendly to us. The food served are delicious and fresh. We also took the opportunity to order dinner and get them to cook fresh mentarangs that we bought in Sungai Besar and they are more than happy to oblige. 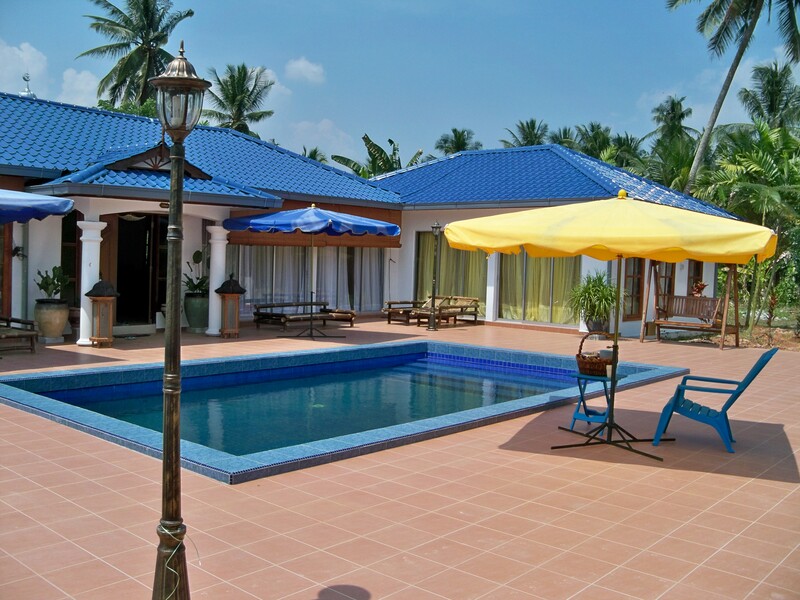 I would certainly recommend this villa to all my friends and families if they plan to stay in Kuala Selangor. This place is certainly better than De Palma Inns where you will have your privacy in the lush greenery, not to mention much cheaper with better personalized services. I would certainly not mind coming again sometimes in the near future. I shall award 5 stars to Firefly Villa with 9.5 / 10 in overall scoring. a very good environment, feel comfortable to stay there.its clean & nice.dont miss out the breakfast its really nice (it consider as 5 star hotel breakfast, i am very enjoy on it)!!! I and my family stayed there just for a night but it was unforgettable stay! Natural place with plantation surrounded and it is peaceful. Love the firefly at the river side, beautiful just like a dangling Xmas tree in the night! Amazing night view! The owner Pak Cik is very friendly and the food served was delicious, my daughter had 2 Curry puffs and we had yummy Nasi Lemak! My girl likes the swimming pool too! The place is clean , tidy and comfortable , it is a pleasant place for family vacation stay. The place is convenient to find outside food too. Thanks for the warm hospitality ! we wanted to take our kids on a weekend getaway at kuala selangor to watch fireflies. by chance my googling took me to firefly villa. wasnt really looking forward at first cos it was our first time staying at a villa. but we were proven wrong. the villa was lovely and prettily situated in a big compound of greeneries. the villa was quaint, clean and comfortable. the owner was very friendly but not intrusive. the breakfast was great too. we’d love to come back and relive the relaxed experienced. what a breath of fresh air from the usual hotel stays. we love it very much. staying for 2 nights in these villa with my whole family, we were treated not even as guests but like long lost families. Both couple owners was very friendly to us & even bought us titbits to bring home. Food that was prepared for us was very delicious as it was prepared “kampong food.” The surrounding of the villa remind us of our kampong that was left 30 to 40 yrs ago back home.The rooms that comfort us was better than some 4star hotel.Our family really enjoy our stay in the villa & hoping that we will definately come back to stay even more nights as Kuala Selangor have a lots of interesting place to explore.To the owner couple, Mr Apandi & Kak Zah, Kudos to both of you & thank you very much for the effort that was put into the travel & tourism industry.